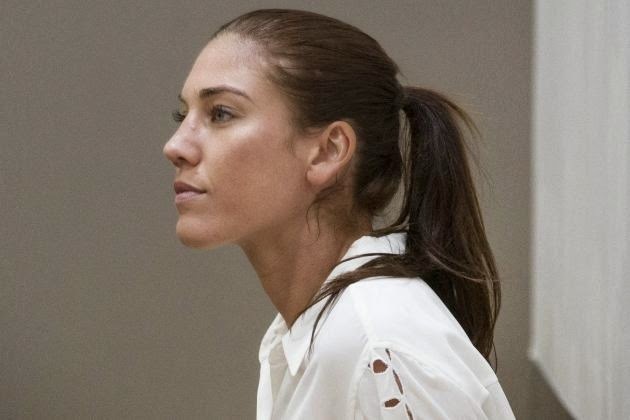 Hope Solo had addressed the reports HERE about the domestic violence charges filed against her after an incident between she and her sister and nephew. Those charges were dismissed today by a Washington State municipal court judge. Hope Solo. goalkeeper for the U.S. women's national soccer team, was facing two counts of fourth-degree domestic violence assault and could have been sentenced up to six months in jail if found guilty. Solo's attorney claimed during the hearing that Solo wouldn't receive a fair trial based on her accusers, and this led to the dismissal of the charges. BREAKING: Judge DISMISSES all charges against Hope Solo. BREAKING: Solo, not present today, had fought the Domestic Violence charges, and denied the claims throughout the process. Solo's attorney claims alleged victims have failed, repeatedly, to sit down for a court ordered interview, and lied about whereabouts. Bleacher Report notes that despite the charges levied against her, Solo has continued to appear for both Seattle Reign and the U.S. women's national team. She wasn't present at Tuesday's hearing due to a USWNT camp, but her husband, former NFL player Jerramy Stevens, was.